One Direction's 'New Year's Rockin' Eve' Performance Kicks Off With "Perfect"
One Direction gave what could be one of their last U.S. performances during ABC's New Year's Rockin' Eve special, ringing out 2015 with a bang sure to leave 1D fans everywhere very emotional. Though the One Direction New Year's Eve performance was pre-taped, according to Entertainment Weekly, that doesn't mean watching Liam Payne, Niall Horan, Harry Styles and Louis Tomlinson appear together before going on hiatus will stop thousands of hearts from breaking across the country. Though One Direction's appearance on the New Year's Eve special was not live, it remains special as what may very well be last One Direction performance to air on American television before their March hiatus. 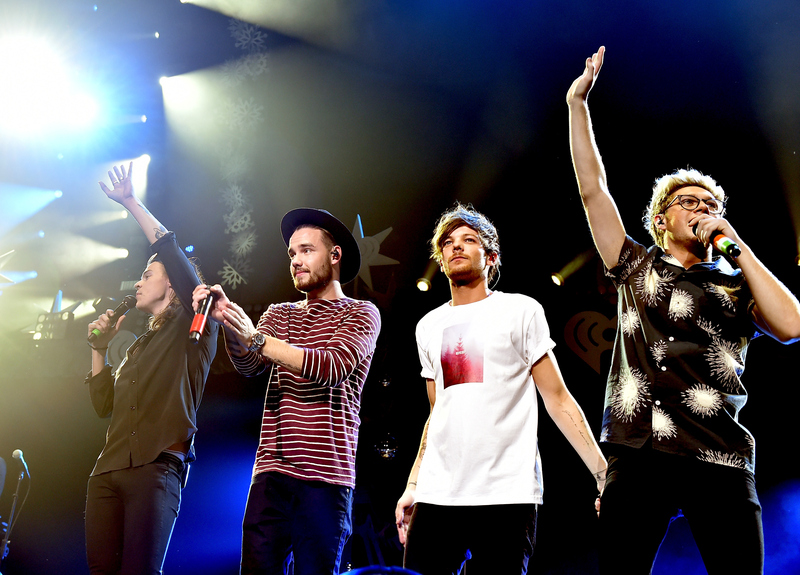 1D performed as headliners of the Billboard Hollywood Party in LA, the West Coast counterpart to New Year's Rockin' Eve festivities in Times Square, hosted by Fergie. One Direction performed "Perfect" for their first turn onstage — the band is set to perform three songs throughout the night, so expect more 1D in the next few hours before 2016 officially begins. When asked by Fergie whether or not this One Direction "break" would mean the group is done for good, all four members were quick to shake their heads. "This is just a short break for us for a while... We just want to take a minute and see where it goes," Liam assured fans. Though technically it will begin in March, it seems that for Harry, Liam, Niall and Louis, the 1D hiatus has already begun. The boys performed their last scheduled appearance on Sunday, Dec. 13 on The X Factor, the U.K. singing competition that brought the band together all those years ago. For that performance, One Direction sang "Infinity" and "History" — both songs off their newest album, Made in the A.M. On New Year's Eve, they instead chose to kick off their final U.S. performance with "Perfect," but it's likely "Infinity" or "History" will be on the set list later.